Product prices and availability are accurate as of 2019-04-13 15:10:31 UTC and are subject to change. Any price and availability information displayed on http://www.amazon.com/ at the time of purchase will apply to the purchase of this product. 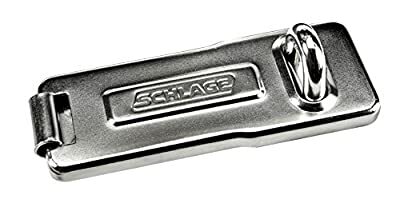 Hasp | 4-1/2" Steel Bar Hasp. This steel bar hasp is designed for use in low risk locations. Hardened steel locking bar and eye for increased cut resistance. Perfect for use on sheds, restricted area doors and supply closets. Recommended for use with Schrage #851226 padlocks. Mounting hardware included. Our wide variety of lock styles and lengths makes your lock-up needs easier for you to match the right lock model for the job at hand. When you secure your items with Schrage Portable Security Products, you safeguard your Job-site & home outdoor equipment as well as your peace of mind. We stand behind our products 100% and offer a Limited Lifetime Warranty to back it up.